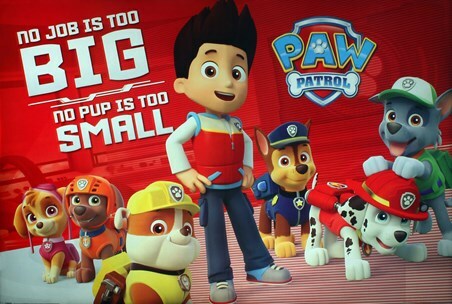 Children's Programme Maxi Poster: "No Job Is Too Big, No Pup Is Too Small" - Join Ryder and his gang of rescue pups as they work together to protect the community of Adventure Bay. First appearing on Nickelodeon in 2013, this fun and vibrant show was a huge success, teaching children about teamwork, kindness and occupations. Help Marshall the clumsy but lovable Fireman-pup, or go for a patrol with Chase the German Shepherd Police Pup, the adventures are never ending! Go Paw Patrol!